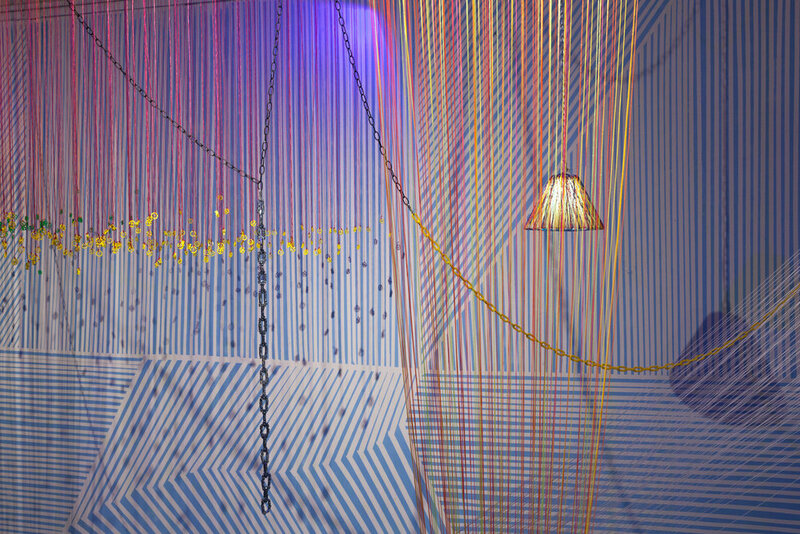 [d℞eams] ◎f c◇l◇rfields was a multifaceted, immersive installation created over three months and displayed in a renovated 8,500 sq/ft. industrial warehouse. [d℞eams] ◎f c◇l◇rfields challenged the idea of “space" by playing with 2D and 3D shapes and forms. Hundreds of parallel lines were painted onto the walls of the entire space to contrast the 20,000 pieces of mason line suspended from the ceiling. The use of receptive lines and forms, encouraged viewers to question their perceptions of the space, and ultimately how they existed in and were a part of this space. It was a juxtaposition between reality and appearances – what truly existed versus what appeared to exist – as a result of optical illusions. The use of high-powered LED light projected onto the work constantly changed colors and created a complex, dynamic installation.